Supamoto® is the solution to your energy needs. We offer a new kind of fuel, made in Zambia specifically designed for both households and businesses. We make pellets out of sustainable forestry waste and we sell stoves that run on pellets instead of charcoal. Our stoves are built with an internal combustion system that produces clean gas emissions from the pellets—producing a hot, clean flame. This reduces cooking time by as much as 75%, allows for indoor cooking, and keeps carbon monoxide at bay. Our stove's flame is so strong, it's more energy efficient than even an electric stove! By cooking with Supamoto, you ensure that you and your family are not inhaling the dangerous amount of carbon-monoxide fumes produced by charcoal. It also is safer for children to play around without the risk of getting burned. Your family spends a lot of time near the stove, so we've created a technology that allows you to rest assured that their health is preserved. SupaMoto® is focused on the future. Zambia is a country with great resources and the potential for tremendous growth. The charcoal industry is extremely destructive to our country's future vitality. If we continue to cut trees for charcoal at this rate we are facing deforestation and the loss of one of our greatest resources. SupaMoto® gives you a chance to be part of the solution and invest in Zambia's future—by using pellets instead of charcoal, you are playing an active role in preserving our country’s ressources. For most households, SupaMoto® pellets are 30 to 40% cheaper than charcoal, so you will save money when you switch over. A 16-kg bag will last you for up to two weeks of daily use. You save money daily on fuel and your investment in a high-tech stove that will last many years will pay off in the long run. Zambia is in the middle of an energy crisis, and most of us are adjusting to daily loadshedding. SupaMoto® is the solution to your power-cut needs. 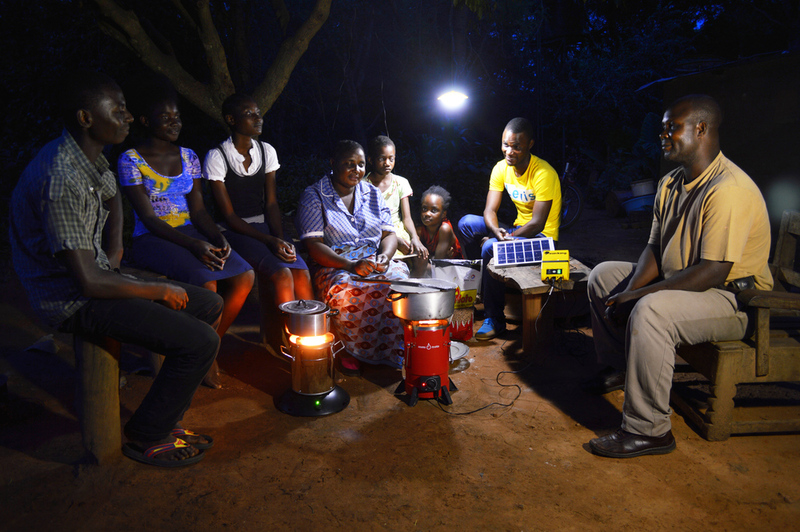 All of the products we sell are designed to power your family when there is no electricity. In partnership with Awango by Total, and other leading solar product companies, we offer solar-energy systems with powerful chargeable lamps, which also allow you to plug in your mobile phones and other small devices. Never miss another text message! Gasifying biomass fanned pellet stove for households and small commercial kitchens with variable settings from very low heat to very high. Our most fuel efficient stove, perfect for your modern indoor kitchen! Comes with a rechargeable built-in battery with solar panel. Can also be run directly off our selected solar home systems. Gasifying biomass fanned pellet stove for households and small commercial kitchens with variable settings for different types of cooking. This stove is safe to cook in your well ventilated kitchen and only uses 600 to 700 grams SupaMoto per full meal. It has a rechargeable built-in battery for the fan. Gasifying biomass pellet stoves with a natural airflow — no fan. Comes in 2 sizes, one smaller for households, one larger for heating chicken runs. Very low carbon monoxide emissions, generates some soot. For outside use only. SupaMoto MAXI and MEDIUM fanned gasifying stoves for commercial kitchens and institutional cooking. Designed and made in Zambia! Used at major canteens and restaurants in Zambia – already cooking 200 000 meals a month! Very low carbon monoxide emissions, no soot emissions. Comes with either a wall plug or a solar charging system. Our core product, SupaMoto pellets are 100% Zambian and 100% renewable, We make them from waste sawdust from pine and eucalyptus sustainable plantations. They come in 7kg, 16kg and 50kg bags. We sell Solar Home systems and Solar lights that charge phones and can charge the MimiMoto stoves. SupaMoto pellets and products can be found in most Total filling stations in Zambia and at our offices in Lusaka and in the Copperbelt. To find out more about SupaMoto and where you can purchase our products, call us or visit us!